I am educated (college, academy and other schools: Management, Marketing, Attorney), and have an experience as a barback in a restaurants / nightclubs. I work on my music project, so, it should be a part time job so that I can have a free time for my music project. 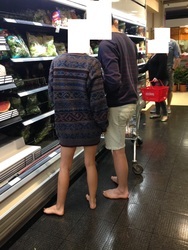 I live this healthy barefoot lifestyle because I am not the sheeple. I am a straight male (not female, sorry), a young man, located in the South-West London, UK, (about Wimbledon / Merton). Please, suggest, what job you have for me. Many thanks. Please, if you or you know who could have a property / home in the South-West London, UK (about Wimbledon / Merton) and you (he/she) need(s) some help at your (his/her) home or if you (he/she) run(s) a business in this location and need(s) someone to work there, please, let me know. Many thanks!